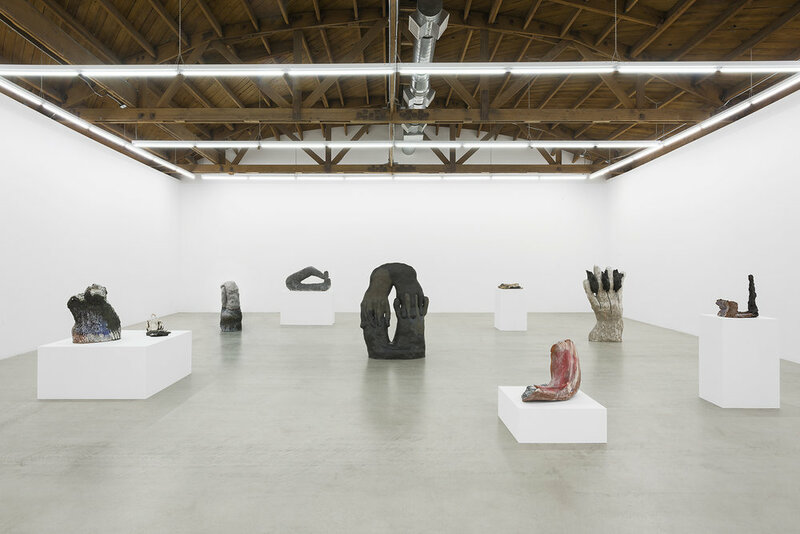 Parrasch Heijnen Gallery is pleased to present Julia Haft-Candell / Suzan Frecon an exhibition of new sculpture by the Los Angeles-based artist in direct historic conversation with works on paper by New York-based abstract artist Suzan Frecon. 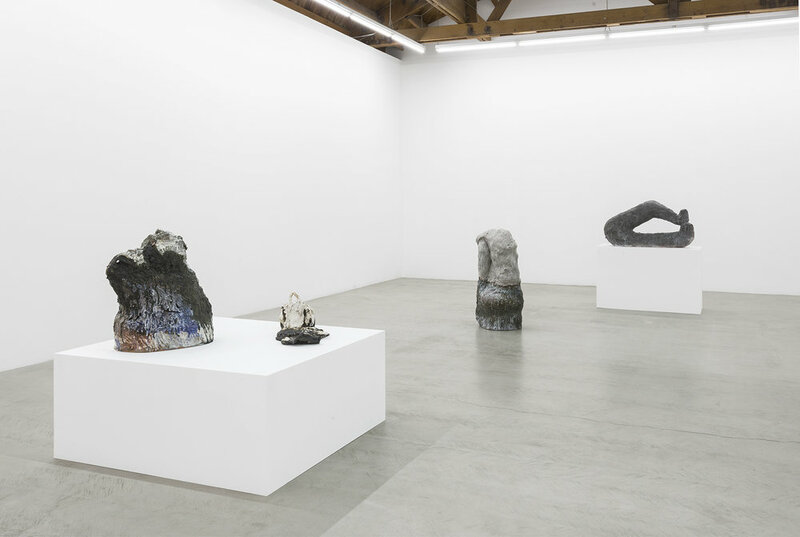 Julia Haft-Candell’s ceramic sculptures re-imagine essentialist forms building upon the artist’s previous vocabulary involving rhythm, repetition, and ritual. This latest body of work presents the familiar in a highly focused context through ambiguous shapes and fluid moments. Haft-Candell’s hand-molded gestures capture the immediate responsiveness of her primary material, as she experiments with subject and scale in relation to the body. The artist often balances the natural with the vitreous in her finishes acknowledging a conscious understanding of her medium’s inherent properties. Haft-Candell’s specific use of glaze intentionally highlights visceral textures and rough cracks, drawing color to form. These ideas are visible throughout her oeuvre as presence and materiality formulate the motivation behind her objects. Haft-Candell views her work as a continuous body that evokes movement and motion in universal symbols to address a greater primordial narrative. 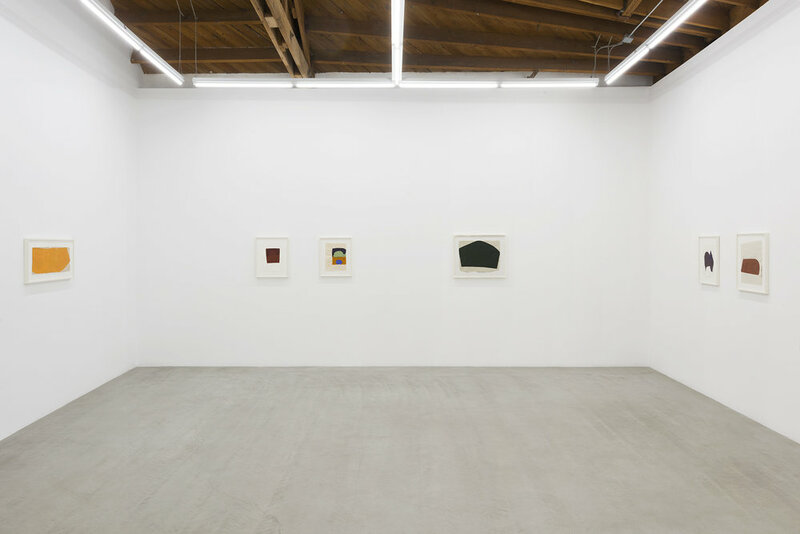 Concurrently on view in the front space is a selection of works on paper by Suzan Frecon. Frecon’s layered application of paint, often on free-form sheets of Indian ledger or handmade Japanese paper, achieves formal completeness. Frecon and Haft-Candell create work through an ethereal spatial balance focusing on the understated minutiae in their organically developed arrangements. Julia Haft-Candell (b. 1982, Oakland, CA) received a BA from University of California, Davis before graduating from the MFA program at California State University, Long Beach in 2010. She spent a summer residency in 2016 at the Skowhegan School of Painting & Sculpture, Madison, ME, and has been awarded multiple grants from the Center for Cultural Innovation and most recently the California Community Foundation Fellowship in 2019. Haft-Candell has been included in numerous solo and group exhibitions nationally. Suzan Frecon was born in 1941 in Mexico, Pennsylvania. Following a degree in fine arts from Pennsylvania State University in 1963, she spent three years at the École nationale supérieure des Beaux-Arts in Paris and studied paintings in museums throughout Europe. Frecon has exhibited widely in the United States and internationally. In 2008, her work was the subject of a major solo exhibition, form, color, illumination: Suzan Frecon painting, at The Menil Collection in Houston, TX, which traveled to the Kunstmuseum Bern in Switzerland. 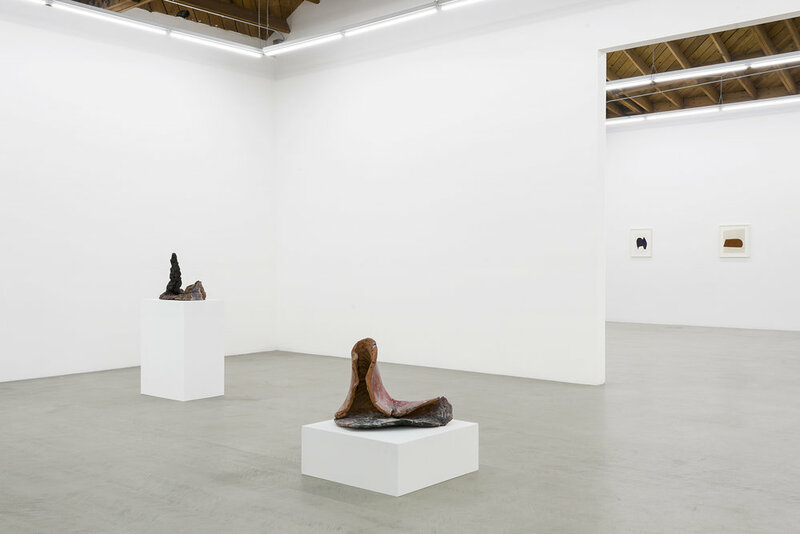 She has participated in a number of group exhibitions such as the 2000 and 2010 Whitney Biennials. In 2016, Frecon received the Artist Award from the Artists’ Legacy Foundation in Oakland, CA. Public institutions that hold works by Frecon include the Art Institute of Chicago; Fogg Art Museum, Harvard University, Cambridge, MA; Kunstmuseum Bern, Switzerland; The Menil Collection, Houston, TX; The Morgan Library & Museum, New York, NY; The Museum of Fine Arts, Boston, MA; The Museum of Modern Art, New York, NY; National Gallery of Art, Washington, DC; and the Whitney Museum of American Art, New York, NY. She lives and works in New York, NY.